The fear is that the Houthi advance will drive a fresh wave of militarisation and radicalisation in the Sunni-majority Yemeni heartland, acting as a recruiter for jihadis. Western intelligence already considers the local al-Qaida faction – al-Qaida in the Arabian Peninsula (AQAP) – the world’s most potent franchise, a growing threat seeking to exploit regional turmoil to widen its scope. At least 137 people died in suicide bombing attacks at Houthi mosques in Sanaa, Yemen today. ISIS has released an official statement through its Wilayat Sanaa claiming credit. Yemen is torn by a power struggle between the Iranian-backed Houthi rebels in the north and Hadi, who has set up a rival power base in the south backed by Sunni-led Gulf Arab states. The mosques in Sanaa are known to be used mainly by supporters of the Shi'ite Muslim Houthi group, which controls most of northern Yemen, including Sanaa. It's a mess in Yemen. Houthi rebels (who are Shi'ite and a minority) have stormed government headquarters, ministries and TV stations in Sanaa. The Prime Minister of Yemen has resigned. Last night UN envoy Jamal Benomar had announced a truce with the rebels. It's unclear what that means now, although Yemen's President says the accord will be signed today. The Houthis are based in the north of Yemen, bordering on Saudi Arabia. As part of their demands, they want Yemen's recent decreases in fuel subsidies rolled back. The fighting is said to benefit AQAP, which has been attacking Yemen security forces while the Houthis wage their battle. Yemen has also been fighting separatist rebels in the south. A U.S. drone in Yemen has mistakenly killed 15 civilians en route to a wedding. They were mistaken for an al Qaeda convoy. Update: Already being debunked. Another report on this from yesterday here. Senior US security officials have explained that "Clothes dipped in the liquid reportedly became explosive devices when dry and might be worn by suicide attackers." Such technology would essentially turn anyone into a terror suspect and make prevention and detection a logistical nightmare. As several media outlets wondered on Tuesday why the Pentagon had been so keen to see its nationals leave Yemen and arrange for the return home of all its non-essential diplomatic staff, in what appeared to be a security frenzy, Wednesday brought the answer, liquid explosive. The report says the creator of the "technological breakthrough" is alleged bombmaker Ibrahim al-Asiri. Update: Not surprisingly, Yemen backtracks, calling the report false and baseless. Yemen authorities now say they have thwarted a major planned al Qaida attack. The attack intended to shut down Yemen's oil exports. a spokesman for the Yemeni authorities said they had thwarted a plot to blow oil pipelines and take control of two ports in the south, responsible for the bulk of Yemen's oil exports, according to the BBC. The plot included using al-Qaeda gunmen dressed as soldiers to infiltrate the ports and a local security source said dozens of terrorists had arrived in the capital to prepare for the attack. The men that the United States is killing in Yemen are tied to the local society in a way that many of the fighters in Afghanistan never were. They may be al Qaeda members, but they are also fathers and sons, brothers and cousins, tribesmen and clansmen with friends and relatives. CNN reports the recent al Qaida prison breaks factored into the decision to close embassies in the middle east and Africa. The Saudi newspaper Asharq al-Awsat quoted an unnamed senior Yemeni defense ministry official as saying that DNA tests of the body have proved that the dead man was not al-Shihri. Saeed Ali al-Shihri, the former Guantanamo inmate who after release, went to a Saudi rehabilitation camp and then returned to Yemen to form AQAP and become its second in command, has been killed in Yemen. The Yemen News Agency announcement is here. This isn't the first time Yemen has announced al-Shihiri is dead. More on Al-Shehri (also spelled al Shihri) and the other top AQAP leaders here. You can read his father's statements disowning him here. 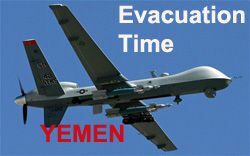 Yemen Judge Orders Al Awlaki Arrest "By Any Means"
Update: Yemen has deployed hundreds more troops to capture al-Alwaki. The news is filled with a terror scare today from two packages with explosives headed to synagogues in the U.S from Yemen. President Obama says it sounds like al Qaida Arab Peninsula. (AQAP.) The Guardian reports cleric Anwar al-Awlaki may be behind it. I'm just getting to the news so I don't have any thoughts on it yet. Here's a thread to discuss it. CNN reports 1,000 Yemen military and security forces have launched an attack in the Shabwa province of Yemen, believed to be home to al Qaeda members, including Muslim Cleric Anwar al-Awlaki, but they say he is not the only target. Yemeni warplanes launched strikes in the Modia district of Abyan province on Tuesday, targeting locations believed to be home to al-Qaeda commander Abdul Munem al-Fahtani, according to the defense ministry website. “The raids at Thaooba area, Modia district, killed a 65-year-old man and two women. No al-Qaeda members were killed,” a security official told Yemen Observer on a condition of anonymity. In the Sunday Times: a feature article on the Obama administration’s "shadow war against Al Qaeda and its allies." In roughly a dozen countries — from the deserts of North Africa, to the mountains of Pakistan, to former Soviet republics crippled by ethnic and religious strife — the United States has significantly increased military and intelligence operations, pursuing the enemy using robotic drones and commando teams, paying contractors to spy and training local operatives to chase terrorists. ...The White House has intensified the Central Intelligence Agency’s drone missile campaign in Pakistan, approved raids against Qaeda operatives in Somalia and launched clandestine operations from Kenya. improved international coordination and support towards Yemen. With the announcement today of the return of a Uzbek Guantanamo Bay detainee to Switzerland, the population at Gitmo is now down to 192. Of them, almost half are from Yemen, more than 40 have been cleared for release. A source close to the Obama administration said the Yemenis had agreed in principle to the establishment of a Reintegration and Risk Reduction Initiative, which would be internationally funded and monitored. Aimed at steering detainees back into society, it would be modeled on previous efforts in Northern Ireland, Saudi Arabia and Jordan.